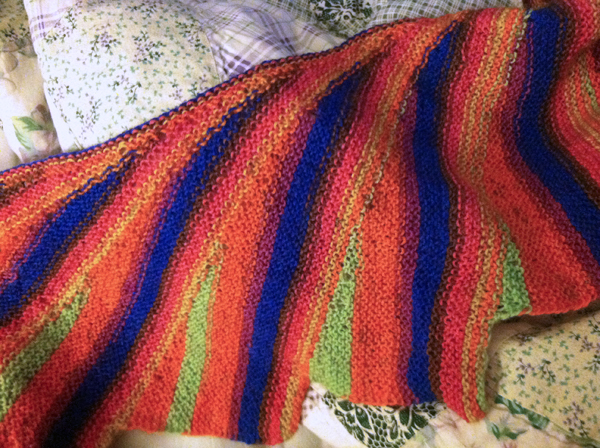 This entry was posted in knitting, shawl and tagged ravelry, wingspan by Susie Kline. Bookmark the permalink. I got this pattern off ravelry and am really excited to try it out! I just had one question–the pattern specifies circular needles. Should I be knitting this on circular needles or on straight needles? Thanks for your help! Maggie, I never knit with straight needles–everything is done on circulars. If you knit on straight, just make sure they are pretty long–90 stitches is a lot! I just got a good start on my second one with the nicest, fluffiest yarn! Good luck! I can’t wait to see yours when it’s done! Just found this pattern and am excited to give it a try. I’m a bit confused on the directions of CO 16 in the middle of my work. Does this mean 16 new stitches, cast on as I did at the beginning or 16 stitches picked up from the edge of a completed triangle? Rhonda, welcome to the addiction! When you get your entire wedge done–you’ve run out of anymore room to move your stitch marker forward three stitches, you add the 16 stitches at the end…not at the beginning. I used a knit-on cast on and it was super easy! Ok then, here we go!! Thanks for the help…..
Beautiful – those colours are perfect for this design. Thanks! My second one is on the needles and is purple and green and white! Lovely! Are you making one? I love this pattern and am just completing my fourth shawl. For the one I’m knitting now I’m using a heavier sport weight yarn with the same number of stitches as the pattern calls for, which makes a larger shawl. Carole I would love to see this one when it’s done! Have you stuck to the exact stitches on your other three? I love the pattern,what kind of yarn and what color? thank,s. It’s OnLine Supersocke 100, the 1278 colorway! This pattern doesn’t seem to be free anymore:( would anyone be willing to send me a copy of it? Sorry, Jenny, I can’t do that. That’s not fair to the designer. I did notice the pattern is 25% off on Ravelry right now, if that helps! Good luck!